"Verichip is now called PositiveID! Roll up your sleeve for the implantable human microchip, it’s now Positive?" Who is at risk to be chipped in 2011? BTC -- Where is the practice of human microchipping headed in 2011? There are still a few carefully concealed marketshares going forward to keep tabs on. Sadly, there has been a longstanding concern over ideation that the United States military actually "owns" their service members and can perform medical experiments on them; that they have lost rights as Americans. In this CNN report some military personnell are being chipped. One wonders, why didn't it cause more outrage? I think because of some of the perverse public conditioning that ground servicemen are more or less disposable Americans who voluntarily put themselves in harms way. In this propaganda piece, GPS opt-in location surveillance is sold to us for our safety and security and emergency preparedness. CNN is has an ongoing curiosity for this type of stuff. People in Mexico are being talked into adopting the chips due to the rates of kidnapping. You don't really need to be microchipped if you carry a cell phone. Location surveillance is simply carried out by your cell phone. However, most people never intended for their communications devices to turn into a personal surveillance tool. Buried in the US healthcare law is a mandate for medical devices. Some fear it's a return to a 2004 proposal put forth by the Center for Devices and Radiological Health to microchip the US populace, this time by 2013. This adds one more log on the bonfires to repeal the healthcare mandate for all Americans. “The Secretary shall establish a national medical device registry (in this subsection referred to as the ‘registry’) to facilitate analysis of postmarket safety and outcomes data on each device that … is or has been used in or on a patient…"
On January 17th a Transatlantic eHealth agreement was signed to promote "a common approach on the interoperability of electronic health records and on education programmes for information technology and health professionals." The current handling of UK's electronic health information data has been strongly contested by privacy advocates who are now able to opt out of certain data processing procedures. Novartis and other pharmaceutical companies are producing a Smart pill technology containing microchips for organ transplant recipients. The chips can transmit internal information to computers and cellphones from inside the patient. Microchipping mandates for citizens with developmental disabilities or diabetes continue to be frowned upon by citizen majorities. It's viewed as something done to animal property - not human beings. One Australian group, WTPWNBC (We The People will not be chipped), put forth a legislative draft to protect people from being involuntarily microchipped or accepting location surveillance as a condition of employment or lifestyle. This would also prohibit companies and governments from coercing or discriminating against citizens who refuse to volunteer for microchipping procedures. This brings us to the more prolific, less fought market for microchipping pets, livestock and other animals. Many European countries and US States mandate animals to be microchipped. If one were to think darkly about it, microchipping your property by mandate is a way for governments to keep tabs on what you own. Lawsuits were pursued late last year over claims that the HomeAgain pet ID chip causes cancer in animals with their brand of RFID implants. "Please Do Not Microchip the Employees (But Biometric Scanning May Be OK)"
When can cops gain access to my personal information on Facebook? BTC -The problem with data privacy is your ability to hang onto it is getting harder and harder. Last year we learned that almost every conventional Internet application and handheld device will leave behind a stream of data which leads back you, Jean Q. Public. You, being any number of marketing and logistics demographic information, of course. Businesses like Facebook became notorious for selling or just giving away your information to unnamed businesses and in some cases the FBI, for non-criminal matters. Laws, like the ECPA, meant to protect your privacy in terms of your electronic communication pre-date the Internet. So, unless there’s an upgrade to digital due process, the information raids on your privacy will probably continue. Here are 10 ideas on how to keep your data yours. The rule of thumb is that you should be able to opt-out of any online or digital service for violations of privacy. 2)Stop reporting everything you do from your web phone or handheld. (iPad, netbook, iPhone 4G) Location surveillance and call information is really really easy to poach or buy from your cell phone provider. Your mobile phone transmits location data about you directly to the web in most cases. Even crappy old phones leave bits of data laying around for snooping computers looking around for you. If you aren’t using your phone and you’re not expecting a call, take the battery out of your cell. It’s the best way to enforce your privacy on your own. 3)Shut off your electronic devices when you’re not using them. This interrupts the stream of data. The proverbial “they” in the unseen paranoid recesses of hackland cannot see you when you shut off your airport or unplug your internet or connection. 4)Contact your local, State and Federal leaders about digital privacy invasions which clearly violate your human right to common privacy. Sick of all the surveillance cameras? Don’t want a fusion center down the road from you? Do they want all of your identity and a blood sample before an approved purchase? If the TSA admin spent too much time checking out your backside on the X-Ray and then asked for a pat down too, it’s time to pick up a phone or a pen to squander the urge to get out the guns and the pitchforks. Seriously. 5)Stay informed of leaks, breaches or the sale of your personal information. Word search alerts will help you be better informed of issues with public and private data breaches. Poke around online for privacy journals. Computing and IT journals are also vigilant on information hacks and breaches. You can also subscribe to blogs like Slashdot, LossofPrivacy, BeatTheChip and PrivacyRights.org and others. 6)Meet the bullies in person ..or at least over the phone. When you are the victim of identity fraud or privacy abuses it will impact the company/corporation/government office if you contact them to let them know where you stand on how your information is being handled or mishandled. While it may be considered confrontational for you to do this, let them know they may be hearing from an attorney next. If a company feels so entitled to sell information about you without your consent, it’s okay to show them you are a real person vs. a data account for sale. 7)Limit your use of credit and debit card transactions. International banking policies are not going to be any nicer about keeping your transactional data private. US “know your customer” policies are deliberately intrusive with one sided protection of your information. You can look out for yourself by limiting the amount of debit and credit transactions, carrying more cash for necessary transactions and carrying through online purchase orders over the phone or via mail with checks, money orders or cashiers checks. It’s analog and slower, but it’s better for privacy. You might even discover buying with cash forces you into local shopping areas with one-of-a-kind stores, with unique finds you couldn’t get anywhere else. It’s worth exploring! 8)Look into existing privacy amenities. You can defend your privacy with existing tools on the market. Oftentimes, there are existing settings you may not be aware of in upgrades. Right now Google is trying out the Do Not Track list for users who do not want their browser histories made available for sale. Most big technology companies have privacy offices who deal with the public. They are usually very helpful, nice people. So don’t call them when you’re mad. 9)Find alternatives to allowing your body images to be recorded as digital information. There’s no easy way out. Companies and government offices seem to want a piece of you no matter where you go- so there is usually a digital record too. When they assume you should automatically give them a biometric or body identifier-like a fingerprint-you can ask for an alternative. If you get someone at the window who gets really demanding about this, you can opt-out or obfuscate the information they want. It’s not illegal...yet. 10) Don’t volunteer up private information to social networks, online gaming, the government, companies or anyone who doesn’t really care about your need for privacy. This is going to take some intestinal fortitude and more attention to detail to follow through with this. Sometimes you aren’t aware of what you are giving up when you sign up to win a hot car or when you visit doctors office and you are asked to fill out a survey. Only give the most focused and relevant information. Does the guy running a bread shop promotion need to know your age and what your natural hair color is? Does the dental office need to ask you about your mental health history? Does the post office need to know your place of employment? Not really. So don’t volunteer unless you really don’t care where that information goes. “Decline to state” or leaving a blank is an option too. The strong point of privacy is that the intimidation and consequences are usually false or unenforceable. The costs to you are great. If your privacy is really valuable to you, trust yourself to look for alternatives to dealing with institutions and people who will put you and data about you in a compromised position in terms of your privacy. 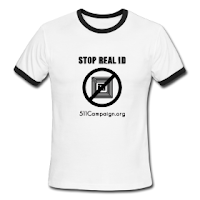 Phil Mocek wins his case against the TSA over the use of ID to fly. Shortly afterward, Jesse "The Body" Ventura - OUR HERO- launched his civil suit against the agency. Homeland Security Showdown commentary c/o Dave Rittgers on Dana Priest's championship budget slaying contest. "A government agent on every corner, a wiretap on every phone" rivals Hoover's "a chicken in every pot" these days. Egypt is in denial. They are clearly flipping out and trying to suppress "revolting" Tweets and Social Networking after Wikileaks dropped a cable concerning Tunisia. One might make the jump from here as to why the "kill switch" bill is returning to the U.S. Congress. In case you didn't hear, Jane Hamsher of Firedoglake was detained for a couple of hours in an attempt to visit Brad Manning, who undoubtedly is being mistreated by his captors. If you're not sure about this, START ASKING QUESTIONS! BTC - Thanks to Mister.re for sending this one over from Truth Dig's Chris Hedges. You may or may not buy into the economic direction of the piece, but I think it still has some really great articulations about the Orwell : Huxley problem of losing our privacy and information liberties. "Orwell warned of a world where books were banned. Huxley warned of a world where no one wanted to read books. Orwell warned of a state of permanent war and fear. Huxley warned of a culture diverted by mindless pleasure. Orwell warned of a state where every conversation and thought was monitored and dissent was brutally punished. Huxley warned of a state where a population, preoccupied by trivia and gossip, no longer cared about truth or information. Orwell saw us frightened into submission. Huxley saw us seduced into submission. But Huxley, we are discovering, was merely the prelude to Orwell. Huxley understood the process by which we would be complicit in our own enslavement. Orwell understood the enslavement." Here's a really balanced article higlighting the fears and concerns of government in the age of Social Networking by Clay Shirky. It's not a fix-it article but it's intention is to keep government from flipping over their own boats. BTC - Corporations... Government data surveillance; same difference. They both do it. "In 1998 the Clinton Administration tested such a privately-funded card without the consent or knowledge of Congress. Their card was part of a special healthcare program funded by the Robert Wood Johnson Foundation. The program was initated in five western States and entailed giving women with dependent children free healthcare in the pilot project that actually tested the effectiveness of the biometric cards, which electronically monitored the whereabouts of the cardholder 24 hours a day, 7 days a week by GPS. The test lasted one year. It was deemed to be a success. Our federal government does have the ability, and the desire, to track the whereabouts of its human capital while they work, when they play, and where they sleep. 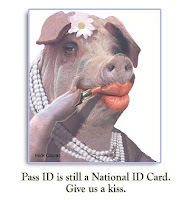 REAL ID, in other words, is REAL Intrusive." Operation Endgame - Illuminates bureaucracy, comedic lunacy of the underground US Intelligence complex; straight to DVD, comes *highly recommended* for entertainment's sake. Smash His Camera - Classic rivalry of privacy in the face of public living. Example here. "The Corporation will, for the first time, bring together Government bodies and data into one organisation and provide an unprecedented level of easily accessible public information and drive further efficiency in the delivery of public services." According to ministers, the cards are voluntary and alternative means of accessing services should be made available, except for concessionary travel. In practice, many schoolchildren have been told that they *must* apply for a card to buy school meals - or even to enter school premises. Each card is linked to a "Citizens Account" unless card-holders explicitly reject data-sharing on the application form. Citizens Accounts are records of personal information stored on a network of databases operated by Scotland's 32 local authorities. A judgement by the European Court of Human Rights ruled that it was illegal for the Government to keep the DNA details of those arrested - but not convicted - for an offence.